Oh, those Meta Space Glasses look so tantalizing. Their concept video got me so pumped I went straight to their site and placed a pre-order. I mean, if what they showed is even remotely possible, the app ideas are endless. The problem is, it has been very, very difficult to discern if what they showed IS remotely possible. Aside from their comment about building it on a Unity 3D-driven platform, there have been very few hints as to how a person could code for this device. "SoftKinetic®, the world’s leading provider of 3D vision and gesture recognition solutions, today announced that meta, maker of wearable computing and augmented reality solutions, has selected SoftKinetic’s 3D camera technology and gesture recognition middleware for the launch of its Meta. 01 wearable device. Meta. 01 is a set of augmented reality Space Glasses featuring SoftKinetic’s DepthSense® 325 camera and an accompanying Software Developer Kit (SDK) that includes iisu®, SoftKinetic’s industry-leading middleware for gesture tracking." So now we know! We'll be using the IISU middleware to program the gesture-based elements of our Meta applications! Yay! And this means we can basically start programming those apps now. "Yes, our relationship with Meta includes our iisu middleware and will be included by Meta with the glasses as a full development system." I'm pretty sure that means we won't have to pay anything. Yay again!! 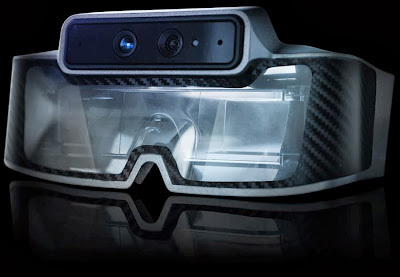 I was a little surprised to find out from them that the SoftKinect sensor that will be used with the Space Glasses, the DS325, is short range and only does hand tracking, but I suppose I should've expected that. At any rate, this was a nice surprise that, after many months of not writing a blog post, I just had to share.